Caveolins are the principal protein components of caveolae, invaginations of the plasma membrane involved in cell signaling and trafficking. Caveolins 1, 2 and 3 are a family of integral membrane proteins which are the principal components of caveolae membranes, organizing and concentrating caveolin-interacting proteins and lipids. Caveolins are proteins of about 20 kD. Caveolin-1 spans the plasma membrane twice forming a hairpin structure on the surface and forms homo- and heterooligomers with caveolin-2. Caveolin-2 protein is abundantly expressed in fibroblasts and differentiated adipocytes, smooth and skeletal muscle, and endothelial cells. The expression of caveolin-1 is similar to that of caveolin-2. Caveolin-3 (Cav-3) or M-caveolin is the muscle-specific isoform of the caveolin family and mutations in the CAV3 gene lead to a large group of neuromuscular disorders. Caveolins preferentially associate with inactive signalling molecules such as Src and Ras family proteins and have been proposed to act as a scaffold for the assembly of signalling complexes. Caveolin-1 colocalizes and associates with the integrin receptors in vivo. It regulates binding of the Src family kinases to the integrin receptors to promote adh esion and anchorage-dependent growth. Other proposed functions for caveolins include regulation of cell proliferation and tumor suppression. OriGene Technologies offers a range of polyclonal and monoclonal antibodies for the detection of the three currently known caveolins. Beside other research applications they are very useful as marker for caveolae. 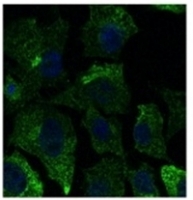 For caveolin 1 and 2 phosphospecific antibody are available. These antibodies can be used in Western blot, Immunoprecipitation and / or Immunofluorescence. Fig. 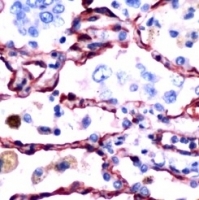 1: Human lung carcinoma stained with anti-Caveolin antibody. Cat.-No. AM11097PU-S, AM11097PU-N and AM11097PU-M. Fig. 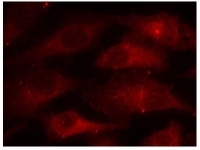 2: Immunofluorescence staining of methanol-fixed HeLa cells using Caveolin-1 pTyr14 antibody (AP02388PU, Red). Fig. 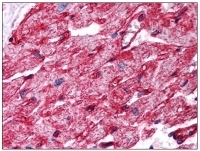 3: AP16383PU-N CAV1 antibody staining of Formalin-Fixed, Paraffin-Embedded Human Heart at 2.5 µg/ml followed by biotinylated anti-Goat IgG secondary antibody, Alkaline Phosphatase-streptavidin and Chromogen. Fig. 4: Immunofluorescence using Caveolin-1 Antibody - Caveolae Marker Cat.-No. AP32097PU-N in Hepa1-6 cells at 1/50 dilution. Cells were fixed with 4% PFA. CEDOC/FCM - NOVA University of Lisabon, Portugal. Fig. 5: AP31081PU-N CAV2 antibody staining of Paraformaldehyde-Fixed A431 by Immunofluorescence at 1/200 dilution. Fig. 6: Western blot analysis of CAV2 Antibody (N-term) (AP17924PU-N) in MDA-MB231 cell line lysates (35ug/lane). CAV2 (arrow) was detected using the purified Pab. Fig. 7: AP08227PU-N CAV3 antibody staining of Formalin-Fixed Paraffin-Embedded Human Breast, Adipocytes at 5 µg/ml followed by biotinylated goat anti-rabbit IgG secondary antibody, Alkaline Phosphatase-Streptavidin and Chromogen. Fig. 8: AP16967PU-N Caveolin-3 Antibody staining of paraffin embedded Human Skeletal Muscle at 3.8 µg/ml. Steamed antigen retrieval with citrate buffer pH 6, AP-staining. Traverso M, Gazzerro E, Assereto S, Sotgia F, Biancheri R, Stringara S, Giberti L, Pedemonte M, Wang X, Scapolan S, Pasquini E, Donati MA, Zara F, Lisanti MP, Bruno C, Minetti C. Caveolin-3 T78M and T78K missense mutations lead to different phenotypes in vivo and in vitro. Lab Invest. 2008 Mar;88(3):275-83. Volonte D, McTiernan CF, Drab M, Kasper M, Galbiati F. Caveolin-1 and caveolin-3 form heterooligomeric complexes in atrial cardiac myocytes that are required for doxorubicin-induced apoptosis. Am J Physiol Heart Circ Physiol. 2008 Jan;294(1):H392-401. Insel PA, Head BP, Ostrom RS, Patel HH, Swaney JS, Tang CM, Roth DM. Caveolae and lipid rafts: g protein-coupled receptor signalling microdomains in cardiac myocytes. Ann NY Acad Sci. 2005 Jun; 1047: 166-72. Li XA, Everson WV, Smart EJ. Caveolae, lipid rafts, and vascular disease. Trends Cardiovasc Med. 2005 Apr; 15(3): 92-6.